FLIR Cloud™ allows you to view your security camera system from anywhere in the world! 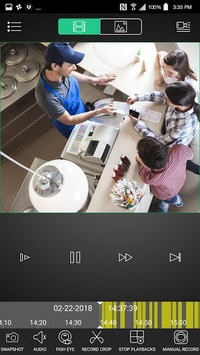 This app uses the exclusive FLIR Cloud™ Service, which allows you to connect to your system instantly with 3 easy steps. Simply download the app, scan the QR code on the system, and enter your password to start viewing live video from your cameras. •	View live video from multiple cameras. •	Playback video saved to the device’s local storage. •	Record video or snapshots directly to your mobile device. •	Remotely control compatible PTZ cameras. •	Configure motion triggered push notifications. •	Android v4.0 and higher. •	High-speed Internet access and a router (not included) are required. Please note that an upload speed of 1Mbps is required for remote video streaming. Up to 2 devices may connect to the system at the same time. •	Connect your system to your router using an Ethernet cable. •	For detailed instructions, see the Quick Networking Guide included with your product.